Quant Hedge Funds: How Did They Lose So Much Money? Many people out there are probably confused when they hear about quant hedge funds taking huge losses over just a couple of days at the beginning of August. 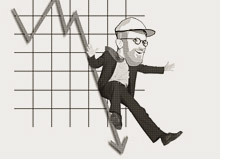 How does a "market neutral" fund suddenly take a 20% dive in just a couple of days? How does a computer driven fund, that aims to be exactly balanced at all times in terms of holding both long and short positions, suddenly lose 1/5th of its value after plodding along for months and months? Here is the best way that I can describe it, in the simplest terms possible. There are many quant funds out there now. As I said, they are driven by computers that seek out the best value on the long side and balance that out by taking positions on the short side as well. A number of factors are usually used, including the profitability of the company, projected growth rates, etc. The fund is looking to remain market neutral, meaning that there will be an equal amount of dollars invested on both the long and short side. Whether the market swings higher or dips lower, the fund should avoid those swings as they have an equal number of longs and shorts. The computerized models are seeking value, so in essence as that value is realized, the fund should slowly increase in value over time, without any wild fluctuations. The problem is that many of these quant funds are invested in the same stocks, as their computerized models for finding value are largely the same. So, in July you had the subprime credit crunch that cost some funds a lot of money. A fund may have taken a big loss due to this crunch, so they decided to offload some of their equity investments, whether that meant selling their long positions or covering their short positions. This had a snowball effect. Suddenly, quant funds were noticing that their long positions were declining in value, and their short positions were rising in value. This led some quant funds to reduce margin and unload positions, no matter what the price. Now, these long positions had declined even more in value, and the short positions had risen even more in value. Despite being market neutral, the quant funds suddenly suffered amazing short-term losses, due to so much crowding of capital in certain stocks. The good news is that should the forced liquidations calm down, the long positions should rise in value, and the short positions should decrease in value. The heavy selling and covering should dissipate, and these stocks should slowly return to what they were trading at previous to all of this quant fund trouble. If funds are hit with a number of redemptions, they will be forced to liquidate even further, creating even more of a bloodbath for all quant funds.